I have been running for 3+ years now, but it wasn’t until I ran over 90K throughout the month of May while training for the 10K Run for Heart in memory of my dad that I finally felt like I could use the term ‘long distance runner’ to describe myself. Up until that point, I was only running for pleasure and weight maintenance, and never had to deal with any of the side effects of running, like the dreaded runners side stitch, muscle pain, inflammation, weight gain, and compromised immune system that come with intense training. For the most part, I was able to combat these things fairly easily. I upgraded my running shoes and started doing proper pre- and post-run stretches to help with the muscle pain I was experiencing in my calf muscles, I tried to sleep more to help combat inflammation and increase my immunity, and I tried hard not to overcompensate my runs with unhealthy food choices to keep my weight gain to a minimum using the tips in the book Racing Weight: How to Get Lean for Peak Performance by Matt Fitzgerald. And while I didn’t do any of these things PERFECTLY, and will definitely need to be more diligent if I ever find the courage to train for a half marathon, the few tweaks I made definitely made a difference. But one thing continued to plague me time and time again. It seemed like no matter how great I felt, and how much I pumped myself up for each of my training sessions, I always ended up with horrible side cramps that made it difficult for me to get through the entire run without stopping one or more times. So I started playing around with different strategies to try and deal with this little issue of mine, and eventually found 3 things that really helped me prevent and get rid of a side stitch so I could run without pain. Over the course of my training, I started to notice a pattern between the intensity of my side stitch and my pre-run eating habits. I initially started to play around with the timing of my meals and snacks, and soon learned that was only a small part of the equation. What really made a difference was WHAT foods I was eating before hitting the pavement – the more difficult the food was to digest, the greater the likelihood it would cause side cramps. I now focus on high carb, low fiber food items before a run like the ones listed below, and save things like salads with raw veggies for my post-run meals. Unless I’m participating in some form of group exercise, I rarely, if ever, stretch before a workout or run. I am forever strapped for time, so the idea of spending 5+ minutes tending to my muscles both before and after a sweat sesh has always felt like a huge waste of effort to me…even though I knew I was putting myself at risk for injury. But when I started getting horrible cramps in my calve muscles as I transitioned from treadmill to outdoor running that threatened to prevent me from running the 10K in memory of my dad, I finally started to take my running career more seriously. I began incorporating a more defined, full-body stretching routine into my workouts, and immediately noticed a difference. Not only did my calve muscles stop hurting, but I found the frequency and severity of my side stitches declined once I started stretching my upper body from side to side with my arms raised above my head before hitting the pavement. While my pre-workout foods and stretches have definitely made a difference in helping me prevent a side stitch before it happens, there are still days when those darn side cramps creep up on me and threaten to bring my run to a complete halt, but I recently remembered a tip I read in a magazine MANY years ago that has totally changed my life. I can’t remember which magazine I read this tip in, but the idea is simple: when a side stitch occurs, simply inhale normally and then exhale as the foot opposite of your stitch hits the ground. So, if the stitch strikes on your right side, you exhale as your left foot hits the pavement or treadmill. It takes some getting used to at first, but you’ll soon get into a groove with this technique and will be amazed at how quickly it works in alleviating side cramps. I find the more forceful I am when I exhale, the faster the stitch goes away. The exact cause of side cramps is unknown, but with these 3 simple tips, you can decrease the likelihood that you’ll be struck with a side stitch while running. And when life doesn’t go accordingly plan (as it seldom does), a little heavy breathing will get you back on your game in no time. 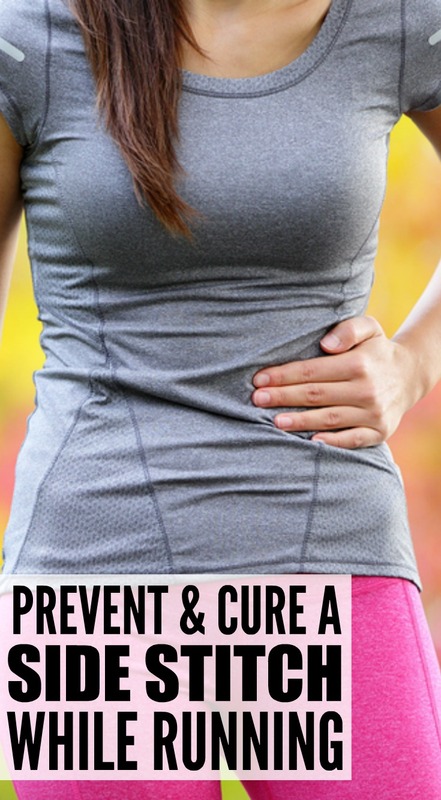 If you found these tips for preventing and treating a side stitch while running helpful, please share them on Pinterest! And if you’re looking for more health-related tips and tricks, please follow our Health and Fitness board where we share all kinds of great ideas!